Spring term is whistling by at school and nursery and my thoughts are turning to half term and planning some fun to keep us all busy during their week off. Hopefully the weather will be kind and we'll be able to get outside and play in the fresh air. Both LM and Bud seem to be growing out of their clothes and I'm in the midst of a huge sort out for their wardrobes. LM seems to have short arms on everything while Bud's trousers and jeans are starting to show rather more ankle than he should. This means that they both needs a few new items so I've been browsing a few of my favourite websites to make a little shopping list. We love Joules and I find their children's clothes to be stylish, well fitted and really hard wearing. 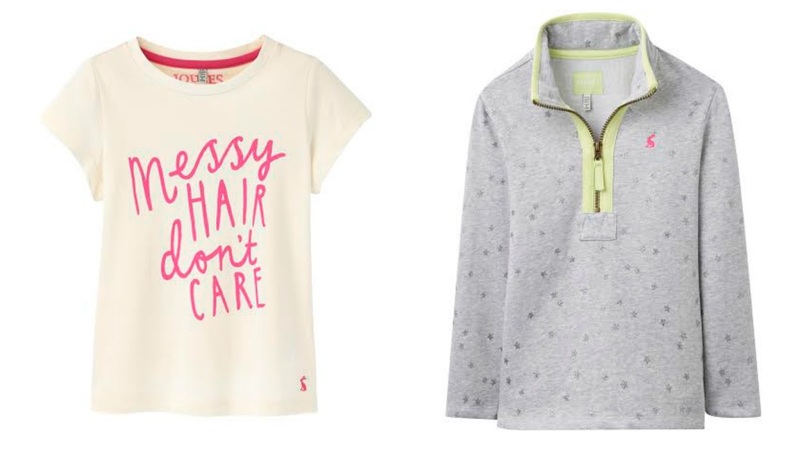 I've found a few key pieces that I think I may well pick up for Bud and LM's Spring wardrobe. It can be a tricky time of year with changeable weather so I always find layers to be the best way to keep them warm. Joules are great at layering. I love this 'Messy Hair, Don't Care' t-shirt. Slogan tees seem to be everywhere at the moment. I'm not usually a huge fan, especially of those that try to be funny. This is something of a catchphrase in our house though as LM often resembles a little scarecrow after a busy day. This t-shirt is cream with bright pink writing and will look fab with jeggings, a denim skirt or a pair of leggings - so versatile. For girls with neater hair there's a great grey marl 'Don't Grow Up, It's a Trap' slogan too. 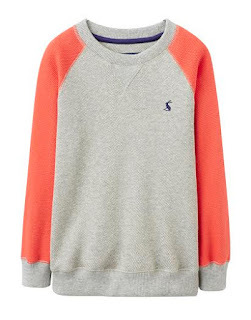 I'm a big fan of Joules' sweatshirts for an extra snuggly layer. New for spring is a lovely grey marl print with sparkly stars all over it. It would be the perfect cover up to keep LM warm on chilly Spring days. I find them especially good for car journeys as they are thin enough to keep her safe in her car seat. The funnel zip neck makes it easy to get on and off and it's available in a bright neon, candy pink stripe for those who prefer something brighter. I often struggle for clothes for Bud now he's wearing age 6-7. Lots of ranges put this age group into older boys which means a more muted palette and a more grown up style than I want for my five year old but I can always rely on Joules for age appropriate, bright, functional clothes. As always Joules have some great boys' t-shirts for Spring. I really like their range of applique t-shirts and this season showcases the current trend for all things space perfectly. 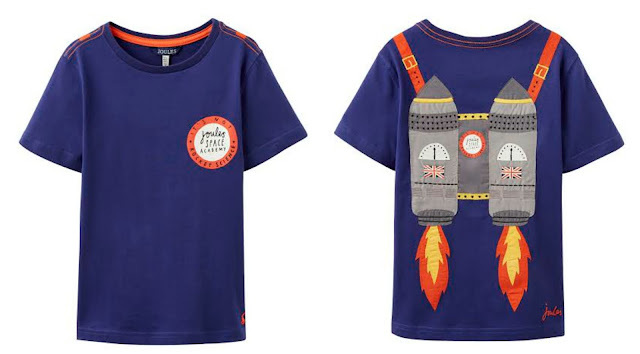 From the front it's a plain blue t-shirt with a small orange space adventurer badge, from the back your little boy is a rocket man! If space isn't your thing then there's a Surf Shark or Pirate Shark too. Bud recently decided he isn't overly keen on hoodies so I've been looking at crew neck sweatshirts as an alternative to these. Joules have two new for Spring, one in blue tones and this grey marl and red raglan sleeve version. These sweatsshirts are made from a new waffle fabric for added texture. The two colour ways will go with everything in Bud's wardrobe and the raglan sleeves will look great under a gilet on those days when Spring is really in the air. 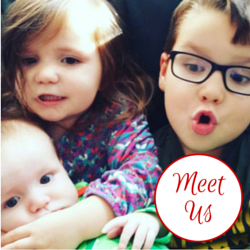 Are you a fan of Joules? Do you have your eye on anything in their current collection?